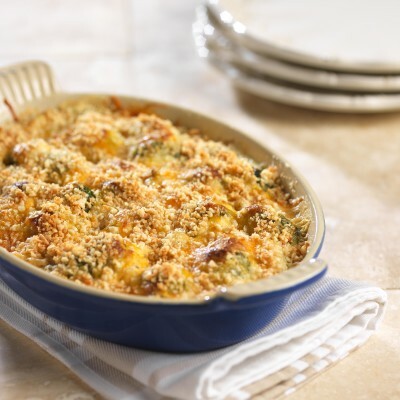 Instead of using a flour-based white sauce and a bread crumb crust, this casserole offers a gluten-free option and a dash of added protein with an almond-based topping. Preheat oven to 350 degrees, butter a medium-sized casserole dish. Place sprouts in partially-covered microwave-safe bowl, and microwave on high for two minutes. When sprouts are cool enough to handle, cut in half lengthwise and place half into casserole. In a small sauce pan, heat milk on medium-low flame until starting to steam but not quite boiling. Add cream cheese, sherry, garlic powder, dry mustard, salt and pepper. Stir gently, softening cream cheese chunks against side of pan with back of wooden spoon until cream cheese has melted and sauce is smooth and creamy. Pour half the sauce over the Brussels sprouts already in the casserole dish. Top with half of the shredded cheddar. Add the remaining sprouts to the dish and top with the rest of the sauce and shredded cheese. Place almonds in food processor and pulse until coarsely ground. Combine almonds with Parmesan cheese and sprinkle over casserole. Dot with butter and bake 30 minutes or until sides are starting to bubble and top is golden brown. Let stand five minutes before serving.